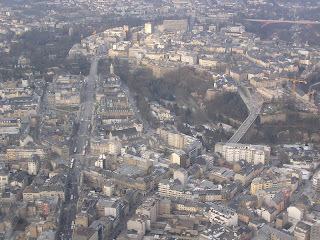 Luxembourg City from a landing airplane. "On Thursday 24 May an Information Day will be held in Luxembourg for the third call for proposals of the eContentplus programme. Subject to the completion of all the necessary procedures, it is intended to launch the call in June 2007 with a provisional deadline for receipt of proposals on 4 October 2007. Further information and the draft work programme as well as the draft call text can be found at http://ec.europa.eu/information_society/activities/econtentplus/calls/proposals/index_en.htm "
Preparing for eContentplus a joint initiative of Austria, Czech Republic, Hungary and Slovakia focusing on co-operation in the field of digital content.